Robotics is a technology that deals with the design and implementation of robots. Robots are programmable machines that can perform actions independently or semi-autonomously. So, a designed, built and programmed robot can function upon receiving commands or actuate on its own using inbuilt memory. The main aim behind creating robots is to ease the work load on people. Through programming, robots can perform tasks such as moving, picking, packaging, perceiving, modifying objects etc. By this, robots can ease manpower from mundane and repetitive tasks. What are the major application of robotics? Industries − Robots can do various tasks such as handling material, cutting, welding, colour coating, drilling, polishing, packaging etc. Military − Autonomous robots can be used in war zones where infantry cannot operate. They can also be used to detect and defuse bombs. Medicine – Robots can not only perform multiple medical tests at the same time, but they can also be directed to perform complicated surgeries such as removal of brain tumors, without any doubt of mistake because they work on ingrained instructions. Space or Underwater exploration – Robots are already in use for exploring places in space or underwater that is both dangerous and inaccessible to humans. Entertainment – Today robots are being effectively used to create animated movies, operate cameras, carryout mechatronics actions etc. The father of Artificial Intelligence, John McCarthy, says, “AI is the science and engineering of making intelligent machines, especially intelligent computer programs”. Artificial Intelligence (AI) is a sub section of computer science that deals with the development of programs that perform actions similar to human intelligence. AI is developed with extensive studies of psychology, mathematics, philosophy, sociology, neuron science, computer science, and biology. The main aim behind creating Artificial intelligence is to create expert systems that can act as aid to humans, and to enable machines to function with human like intelligence. Without AI, a program can only answer some pre-set questions. Modifications can only be done by making changes in the system and structure of the overall program. Whereas with AI, a program can answer commonly asked questions about any problem, as it adapts and learns on its own. So any modification that needs to be done is easier to implement without having any overall effect on the program. Some functions that an Artificial Intelligence program needs to perform are – learn, perceive, understand languages, solve problems, and have logical reasoning. It also have complex programs like language detection, speech detection, face detection, etc. Almost all the smart phones and laptops these days have AI programs. Classic examples are Google Assistant, Siri, Cortana, Alexa etc. What is the basic difference between robotics and artificial intelligence? In short, a robot is a machine which may or may not require intelligence to perform specific tasks and has a physical form. Whereas an AI is a program so it doesn’t need to be physical. AI can function in cell phones, laptops, robots even, and performs tasks which are most likely related to systems, algorithm and information – analysing and computing a certain result. There is one type of robot that is immobile and doesn’t have a body, such as the popular chatbots, that function inside programs. Some people may argue that these cannot classify as robots because robots need to be physical and function accordingly. So, could these chat bots classify as Artificial Intelligence? Yes, because these chat bots do use AI to function effectively and has the ability to learn and execute tasks on their own. Even the assistant that you are seeing in this window is a classic example of AI integrated Chabot. You can simply ask any question to the bot and get a spontaneous and relevant reply immediately. And this bot can process millions of such queries at the same time without pulling a single muscle. So one can summarise it as – Artificial Intelligence exists inside systems, in software and robots need to have a body and perform physical tasks. What are artificial intelligence integrated robots? Artificially Intelligent robots are the merge of Artificial Intelligence and robotics, where Artificial Intelligence programs are embedded onto Robot systems. Artificial Intelligence plays a key role in making robots intelligent. Artificial Intelligence questions the knowledge required in various forms of thinking. From how the knowledge should be represented to how it should be used. On the other hand, Robotics brings artificial intelligence into the real world and deal with objects in real time. Certain methods and processes developed for solving cognitive issues don’t always merge AI and robotics. 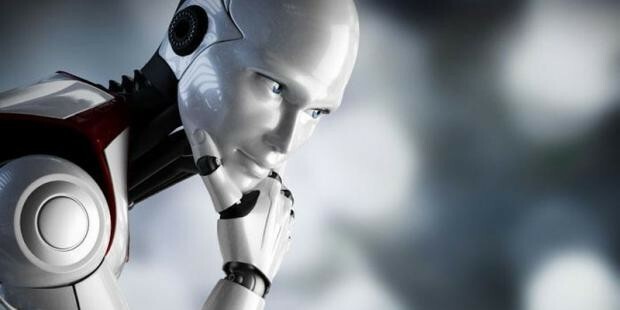 While robotics deals with mechanical components such as computers, effectors and sensors; Artificial intelligence contributes to the reasoning and perception of it. So, together, Robotics and AI can create new problem-solving methods and function effectively, complementing each other. Robots usually have preset programs where they are programmed to do a certain set of tasks with some limitations. But a programmed artificially intelligent robot can do tasks like perceiving and analyzing objects spontaneously. And even software robots like web crawlers can search the entire Internet in no time and de-clutter data. An added benefit of using Artificial Intelligence in robotics is computer vision. Computer vision is an innovation under AI that gives the robot a vision. Computer vision plays an important role in aspects of security, health, aid, entertainment etc. It can independently identify, analyze and understand important information from one or many images and thus enables visual comprehension. Object recognition that can help register data, along with the estimate of the distance between the object and the robot, or human. Domains that computer vision can help with are – Agriculture, Industries, Face recognition, Forensics, Security, Pollution Monitoring, Robotics, Transport, Gesture detection, Automatic Vehicles, Medical aid and detection. What are the applications of artificial intelligence on robotics? With the help of Artificial Intelligence, robots are able to perform tasks better with multiple sensors and information processors. Adding computer vision, speech detection, locomotion and data understanding makes Artificial Intelligent robots more efficient than we can ever imagine. Artificially Intelligent Robots are also capable of performing tasks on human commands. They are equipped with sensors to detect physical information like temperature, sound, light, movement etc. They have expert processors to use these modules effectively. They are also adaptable and have self-learning skills. Artificial Intelligence help robots to not only grasp information using sensors from their surroundings but also convert that information to an application when assigned a task. It also makes the robot to store the information for later use, perceive and learn from it. Artificial intelligence also enhances the robot’s decision-making skills. Two types of artificial intelligence are compatible with robotics. First is the software intelligence (provided by microprocessors, microcontrollers) that controls the hardware to carry out various actuations and make decisions. The program further learns and adapts with experience. The second type is hardware intelligence where the robot is allowed to imitate how humans process information through learning circuits. What are the advantages of integrating artificial intelligence on robotics? The major advantages of artificially intelligent robots are social care. They can guide people, especially come to aid for elderly people, with chatbot like social skills and advanced processors. They can also be used for exploration in places where humans can be harmed. Like volcanoes, deep oceans, or extremely cold conditions, or even in space. They can also perform complex surgeries that have a higher risk of mistake by humans, but with a pre-set of instructions along with added intelligence. AI integrated robotics could reduce the number of casualties greatly. So now you got a glimpse of how Artificial Intelligence is advancing and impacting the robotics industry as we see it. If you are an aspiring engineer to develop a career on this innovative field, you need to get skilled on latest technologies. These technologies may include <robotics>, <computer vision>, <automation> etc. And it is now super easy to get skilled on these technologies with Skyfi Labs. The courses provided are project based and you will learn the concept by building innovative projects right from your home. Do comment below with your queries and suggestions. We will get back to you immediately.